The Doorbell Problem: How to Stop Your Dog from Barking. If I had a nickel for every time someone asked about how to stop their dog from barking when the doorbell rings, I could hang up my training leads, retire to the Bahamas, and live out my days snorkeling and drinking margaritas. This article has been on my mind for a long time, because the doorbell/barking problem is one of the most common issues out there. Sadly, it’s also one that is far too rarely fixed—even though it is fixable. Why? Because most solutions are focused on the behavior—not on the fundamental cause. 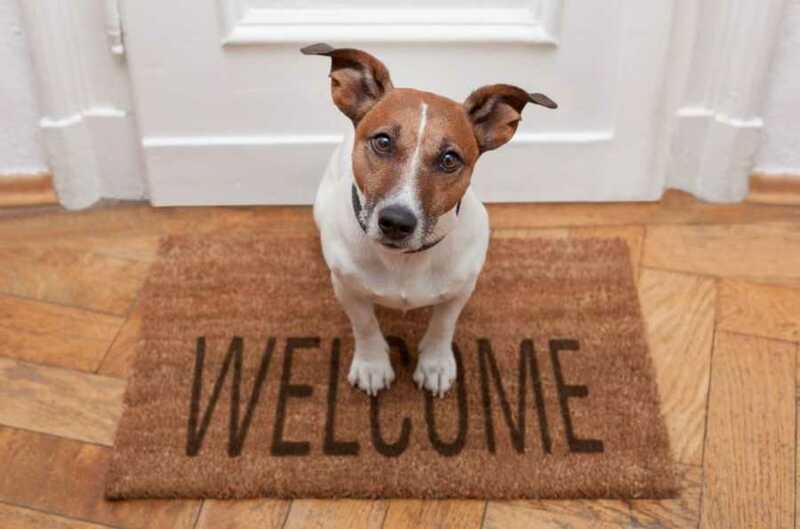 There is absolutely nothing wrong with a dog giving a quick bark or two to alert you of a person’s presence on your front porch. Depending on the dog, it might think, “YAY, friends!” or “There’s someone on my turf.” Both responses are completely normal, nothing to worry about. But far too often, dogs start barking uncontrollably whenever the doorbell sounds. They start to go crazy, with an almost panicked excitement. And when this starts to happen, you know that the dog is associating something different with the doorbell. It’s no longer a cool, chill, “Hey, there’s someone here.” Instead, it’s something far more problematic. But where does this reaction come from? Dogs have various drives. In this particular case, what’s going on has to do with defensive drive. Defensive drive is extremely powerful and dangerous because it is rooted in a dog fearing for its safety—and a dog with this visceral fear is extremely hazardous. There are many things that will push a normal pet dog into displaying defensive drive. Being allowed to bark repeatedly when the doorbell rings is one of them. Then, many people inadvertently kick defensive drive into high gear. Praise for being a good guard dog. Check. Soothing to stop the barking. Check. Allowing window barking. Check. The list goes on and on. Remember: this is a fear-based drive. That means that as long as the fear goes unaddressed, the problem will only continue to get worse—and it’s reinforced by association and a flood of pleasurable dopamine in the brain. A quick note: A lot of the positive people will tell you that you can’t reinforce an emotion, like fear. Technically speaking, if you look at dog training from their narrow perspective and use words like “reinforce” in the very strict ways they do, they’re correct. But if you reject the idea, as any thinking person must, that a dog doesn’t have motivations and feelings that operate outside the confines of stimulus-response, it’s pretty clear that you can, in fact, encourage a dog to have a particular emotional response to a stimulus. I see it every day. Just because a study doesn’t show something is true doesn’t mean that that it’s false. A doorbell barker is a ticking time bomb. It starts at the door, and the problem gets worse and worse. These dogs often spiral completely out of control—shredding mail as soon as it gets put through the slot, scratching doors trying to get at whatever is on the other side, barking furiously at anyone who comes anywhere near the house, “window stalking” people and dogs passing by … And outside the house, some of these dogs become leash reactive. Simply put, they never feel safe. Not in their own house, not outside. Train your dog, fix the problem. I know I sound like a broken record sometimes when the answer to every single problem is training. But it’s true. More than anything, our dogs want us to guide them through life. They look to us to show them what is safe and what is not. In short, they want our leadership. But more than that, it’s our dogs that pay the price. Our dogs deserve better than the drivel that these people are spewing. There are so many wonderful people out there who love their dogs and want to do the right thing, and they keep getting taken for a ride. And then I look at the dogs—scared and anxious and instead of getting leadership, they get a cookie. Some days I just want punch a wall. Because you know what? Dogs are amazing. If a person doesn’t lead, their dog will step up to the plate and do it himself. Yeah, I know. The irony here isn’t lost on me—after all, this is most of what we fix every day. But you just can’t beat the strong spirit and stout heart of a dog. Train your dog. Give him structure. Make her feel safe. Learn how to say no (without feeling guilty for it). Train your dog to heel. I can’t emphasize the heel enough. When your dog learns to focus on YOU, anything is possible. Keep your dog calm. Play and fun are fine—but no window, fence, car, carrier, front door, window or any other crazy barking. For instance, you can tell your dog to go lie down whenever the doorbell rings. This action tells them there’s nothing to fear and refocuses their energy to you. Think you won’t be able to tell your dog to lie down when the doorbell rings? I promise you—if you put the time into training, you will. This is why we train. When Dutch, my working-line Dutch Shepherd gets a little too rambunctious inside, I ask him if he needs a time out. He puts himself in one. If you’re not at home and you have a door or window barker, crate your dog while you’re gone. You’ll have to work up to this if you haven’t already crate trained, but dogs actually like crates. They’re like dens, and can be extremely comforting and soothing.